Live comedy show in the style of old-time radio. Written and performed by college students and community members. 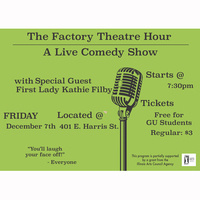 Special guest Kathie Filby shares some stories and performs with the FTH crew.